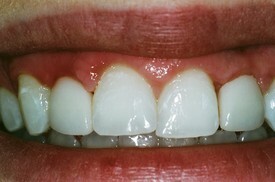 Before: Patient had mal-aligned teeth for many years. 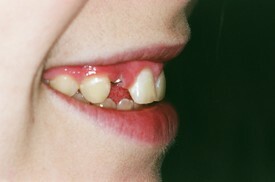 Front tooth was lost and patient was wearing a one tooth denture. 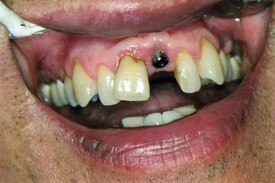 Dental implant was placed in area of lost tooth. After: We realigned the smile with all ceramic crowns and a dental veneer as well as restoring the dental implant with an implant crown. 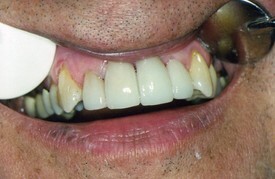 Restrations by Dr. Babbitt, lab work and custom shading by Pacific Gnathologicals, Ventura, CA. The patient was thrilled with the result. 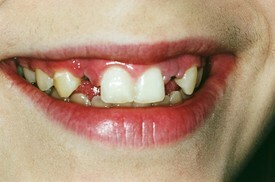 This patient was missing the lateral incisors since childhood. Restoration was a team approach utilizing orthodontics (Dr. Hannah, Ventura, CA), bone grafting and dental implants (Dr. Zarrinkelk, Ventura, CA). Final restoration was with Dr. Babbitt, which included professional dental whitening (Nitewhite), diode laser tissue engineering with custom implant provisionals, custom all ceramic abutments and custom shaded all ceramic crowns. (Lab work done by Pacific Gnathologicals, Ventura, CA). 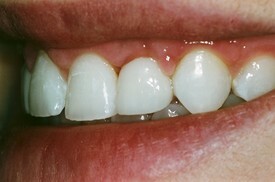 Photos taken on the day of delivery, gum tissues will heal and firm up now that the final restorations are in place. Patient was very happy with the work.